Just as the pro-choice movement is getting proactive, Washington will get even more hostile. What we know so far: It’s going to be bad. Even if Roe v. Wade somehow survives—the chances that Donald Trump will be able to install that crucial fifth anti-choice justice on the Supreme Court are excellent—the Court will surely look favorably on state and federal restrictions that place abortion out of reach for ever more women. We are looking at more 20-week bans, more mandatory ultrasounds, longer waiting periods, and more bizarre requirements, like fetal funerals, whose only purpose is to encumber clinics and make abortion more difficult and more expensive for women. Congress is likely to make the Hyde Amendment—which bars federal Medicaid funds from being used for poor women’s abortions and must be renewed every year—permanent. It will also probably defund Planned Parenthood by barring its clinics from being reimbursed by Medicaid; that’s a loss of a half-billion dollars a year for a health organization that primarily serves low-income women and often provides the only care they get. More money, by contrast, will be lavished on crisis-pregnancy centers, which use Christian proselytizing, deception, and manipulation to keep women from reaching clinics in time. Birth control isn’t likely to fare well either. The Senate has already voted against requiring no co-pay contraception coverage in whatever replaces the Affordable Care Act. Tom Price, Trump’s fervently anti-choice pick for head of the Department of Health and Human Services, says he’s never met a woman who can’t afford to pay for her own birth control. Katy Talento, his pick to run health-care policy on the Domestic Policy Council, claims, without evidence, that hormonal birth control causes miscarriage and infertility. On choice, “the federal government is now Kansas,” says reproductive-rights activist Frances Kissling. Now that Republicans control 25 states, both houses of Congress, and the White House, there is little to prevent them from going all in to make abortion unavailable, unaffordable, humiliating, and even criminal. (And don’t forget the 100-plus open federal judgeships that Trump will get to fill.) After all, Trump told Chris Matthews that if abortion became illegal, women should be punished for having one. He retracted that statement after a storm of protest, but according to a post-election poll, 39 percent of his supporters agreed with him. Already, women have been charged with crimes related to ending a pregnancy themselves: Indiana’s Bei Bei Shuai, who tried to kill herself and delivered a baby who died; Purvi Patel, sentenced to 20 years for feticide (her conviction was overturned after she had spent a year in prison); and Pennsylvania’s Jennifer Whalen, who was convicted of a felony for offering consultation about abortion without a license for giving her daughter an abortion pill purchased on the Internet. And remember when pro-choice activists were mocked as hysterical crones for using the coat hanger as a symbol? After she tried to end her pregnancy with that primitive, dangerous method, Anna Yocca of Tennessee was charged with first-degree murder and, when a judge threw that out, with aggravated assault with a weapon and criminal abortion. Last week, after spending a year in jail awaiting trial, Yocca agreed to a plea deal. The irony is that even as anti-choice jihadis gear up to take power at every level of government, support for birth control and abortion has surged. The most recent Pew poll found that 69 percent of Americans support Roe, the highest in years. The birth-control provisions of the Affordable Care Act are hugely popular and have enabled millions of women to obtain contraception, including expensive but very effective long-acting methods like the IUD (the lowering of the abortion rate in recent years is mostly due to more widespread and better birth control). Good things were happening in the pro-choice movement, too, with the emergence of a new generation of activists, many of whom are women of color. 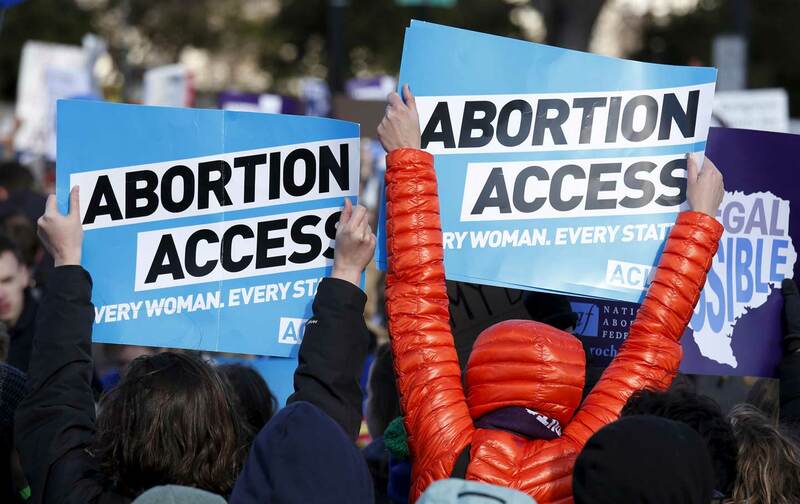 “We’ve been playing off our opponents’ agenda, in response mode,” says Destiny Lopez, co-director of All Above All, a group dedicated to lifting bans on abortion coverage. In the last few years, that’s changed: The movement really seemed to be getting a fresh boost of energy and creativity after spending decades in a defensive crouch. Activists put reproductive rights in a broader framework, demanding the right to give birth safely and raise children well; mainstreamed new forms of activism; and made bold demands, like abolishing the Hyde Amendment. Representatives Barbara Lee, Jan Schakowsky, and Diana DeGette introduced the Each Woman Act, which would require Medicaid and insurance plans to cover abortion. Especially after the Supreme Court’s decision in Whole Women’s Health v. Hellerstedt, which struck down the medically useless requirements that had closed so many clinics, it seemed like the movement was poised for some wins. Instead we got Trump, Pence, and a GOP-controlled Senate. It’s a bit like the old joke: The operation was successful, but the patient died. “I don’t know how you get beyond anti-choice Republican control in many states,” the reproductive-rights activist Frances Kissling told me. “And now the federal government is just as bad. The federal government is now Kansas.” According to Yamani Hernandez, executive director of the National Network of Abortion Funds, “People are asking, ‘What are the marching orders?’” Some efforts are focusing on shoring up women’s rights in blue states. In New York, Attorney General Eric Schneiderman has introduced legislation that would require insurance plans to make birth control cost-free no matter what happens with the ACA. Donations are pouring into Planned Parenthood. The women’s march slated for January 21 in Washington, DC, and other cities is shaping up to be enormous. (And, yes, men are welcome.) After a rocky start as a gathering in favor of apolitical girl power, the march has turned into a progressive demonstration supporting women’s rights as well as immigrant rights, Black Lives Matter, unions, and more. “We believe Gender Justice is Racial Justice is Economic Justice,” the organizers wrote. See you there! Editor’s note: An earlier version of this article referred to Bei Bei Shuai and Jennifer Whalen as women who had been arrested for attempting to self-abort. The text has been corrected.